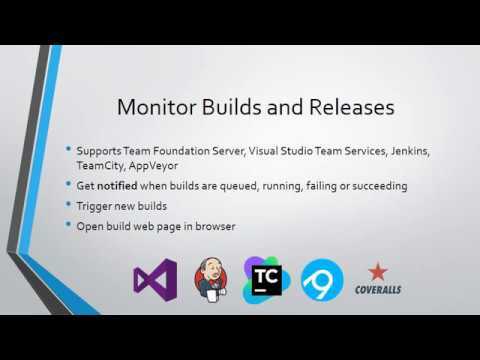 AnyStatus is a lightweight desktop application designed to bring you metrics and events from various sources such as local services, network, processes and integration services, including but not limited to TFS, Azure DevOps, Jenkins, AppVeyor, TeamCity and more. All things considered, AnyStatus is a simple and straightforward program that enables you to keep track of all relevant processes and services on the back end of your development workflow. AnyStatus was added by AnyStatus in Feb 2019 and the latest update was made in Mar 2019. The list of alternatives was updated Feb 2019 There is a history of all activites on AnyStatus in our Activity Log. It's possible to update the information on AnyStatus or report it as discontinued, duplicated or spam. Alternatives to AnyStatus for Windows, Mac, Linux, Microsoft Visual Studio, Web and more. Filter by license to discover only free or Open Source alternatives. This list contains a total of 6 apps similar to AnyStatus. No reviews yet for AnyStatus, want to be first? Maybe you want to be the first to submit a comment about AnyStatus? Just click the button up to your right!